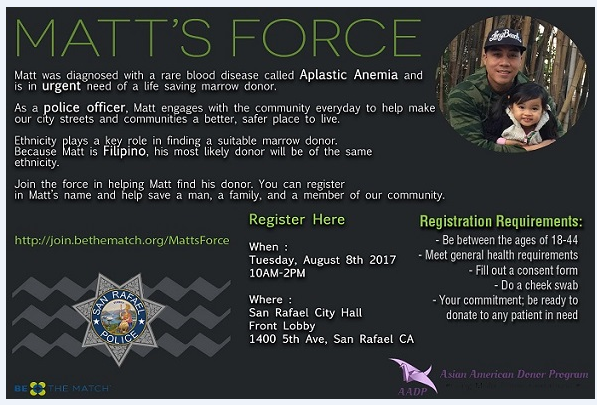 On Tuesday, August 8, 2017 from 10 a.m. to 2 p.m., the San Rafael Police Department in partnership with the Asian American Donor Program is hosting a Bone Marrow Donor Drive. The purpose of the donor drive is to help find a match for Officer Matthew Medina, a seven-year veteran of the Los Angeles Police Department. Medina is reportedly suffering from Aplastic Anemia, a blood disorder that requires a bone marrow transplant to survive. Unlike other types of transplants, bone marrow donations are required to be even more genetically similar to their recipients. The success rate to find matches is much higher between donors and patients of the same ethnic background. Medina is Filipino. Currently, Filipinos comprise only a half percent of people registered as potential marrow donors, making the odds of finding a match such an overwhelming challenge. The Asian American Donor Program is a multi-ethnic program and encourages people from all ethnicities to become donors. To register for the Bone Marrow Donor program, prospective donors must answer some basic questions regarding their health and be between the ages of 18 and 44 years old. For more information about Bone Marrow Donation go to the “Be The Match” Website. The sample collection requires only a swab of the inside of the donor’s cheek. Those interested in becoming a donor can register in person at the San Rafael donor drive, located in the lobby of City Hall on August 8th.